Port of Berbera (file photo). 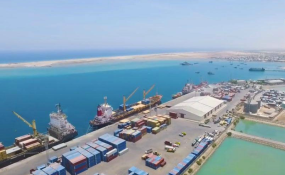 The groundbreaking ceremony for the construction of Berbera Port is scheduled to take place on October 11, 2018. The ceremony is expected to take place with of Sultan Ahmed bin Sulayem, the group chairman and CEO of DP World in attendance. The winning company, which will undertake the construction, has not been announced. The expansion project is planned to be built on an 800sqm area in two phases. The first phase, which will be executed with a 232-million-dollar investment, will sit on 400sqm and can accommodate two vessels at any given time. The expansion includes the construction of additional berths. The existing old port facility has a 650-meter-long linear wharf. Berbera's facility encompasses more than 600sqm with terminals for containers, general cargo, an office building and other properties. Ethiopia has acquired a 19pc stake in the port, while DP World and Somaliland hold a 51pc and 30pc stake, respectively.